Last Updated: Apr 20, 2019 @ 9:12 pm. We waded through 74 lightweight strollers—folding, unfolding, buckling, un-buckling—until we found the very Best Lightweight Stroller 2019: the Baby Jogger City Mini ( $259.99 on Amazon). Scroll down for our picks for Best Budget-Friendly Lightweight Stroller, Best Lightweight Stroller for City Dwellers. New to stroller shopping? Read our 7 Things No One Tells You About Buying a Stroller for advice and tips. FYI: Baby Jogger is rolling our a new version of the City Mini, called the City Mini 2. It will have some new features and a new price. Check below for more information on the new City Mini 2. Lightweight strollers are the holy grail of the stroller market—enough convenience features (easy fold, cup holder) for parents and comfort (canopy, seat pad) for baby, but not too much to add unnecessary weight. We generally define “lightweight” as strollers under 20 lbs. empty (not including baby!). Our pick in this category is the Baby Jogger City Mini, an excellent tri-wheel stroller with oversized canopy and fully reclining seat. Baby Jogger’s quick fold technology is amazing—you lift a strap in the middle of the stroller and zip! It’s folded. An optional car seat adapter can turn a City Mini into a travel system if you wish. As a brand, Baby Jogger has a good reputation for quality. Now owned by Graco, Baby Jogger got its start by making (you guessed it) jogging strollers in the 80’s. After going through a bankruptcy and ownership change in the early 2000’s, the company pivoted to making easy-to-fold strollers in both the lightweight and multi-function markets. Scroll down for more details on the City Mini. Holy folding miracle, Batman! The Baby Jogger City Mini’s quick fold is impressive—ditto for the extended canopy and overall quality. The tri-wheel City Mini (single $259.99, 17.1 lbs. ; double [amazon_link asins='B019W8W8KK' template='PriceLink' store='babybarg-20' marketplace='US' link_id='885adaaf-13bc-4f74-91bc-df2f0a32d7ca'], 26.6 lbs.) is Baby Jogger’s best-selling stroller, featuring a full recline and large canopy. The Baby Jogger City Mini folded—while this isn’t the most compact fold on the market, it will fit in most trunks. Baby Jogger also makes a raft of accessories for the City Mini: everything from weather shields to glider boards (for older toddlers to stand on), as well as a foot muff, cup holders and parent consoles. That’s the advantage of going with a brand like Baby Jogger. Less expensive lightweight stroller brands typically have few (or no) accessories. FYI: We should mention that Baby Jogger also has various spin-offs of the City Mini, including the newer City Tour (a four-wheeled version with more compact fold) and City Mini GT (with more rugged wheels). See our complete review of the Baby Jogger brand for details. 2019 update: City Mini 2! New for 2019, Baby Jogger is rolling out a reboot of the City Mini called the City Mini 2. At the time of this writing, it was just rolling into stores. The City Mini 2’s fashion is toned down to reflect current trends: light grey, dark grey and a really dark grey. Besides a blue-ish gray (Slate), gone are the bright jewel tones of the original City Mini. Unfortunately, the price has also risen. The manufacturer’s suggested retail is $279 (although that will likely drop somewhat once more retailers start carrying it). Compare that to the price of the older version: $259.99. We’d guess for a while both the original City Mini and the City Mini 2 will be on the market, before the original City Mini fades a away. Overall, this is much-needed fresh for a stroller that, while a best-seller, had not been updated since 2008. At $66, the Kolcraft Cloud Plus features a standing fold, cup holders for both parent and child. It’s rare to see an extended canopy at this price point. Best Budget-Friendly Lightweight Stroller. Kolcraft’s entry-level strollers are winners. Dollar for dollar, these are the best affordable strollers on the market. Compared to other low-end brands (Graco, Cosco), Kolcraft shines. The entry-level offering is the Cloud, which comes in two versions. The basic Cloud umbrella stroller sold at Walmart for $25 is a simple umbrella stroller with cup holder, storage basket and extended canopy—a great deal for $29. The Cloud Plus adds a one-hand fold, multi-position seat recline and child snack tray for $62.99 (11.8 lbs.). There’s even a Cloud Double side-by-side stroller for $70.99. We like the affordable Cloud strollers—parents tell us they are a good value for the dollar, praising the simple fold and extended canopy (something often missing in the under $100 stroller market). With larger 8.5″ foam-filled tires, the Baby Jogger City Mini GT is ready to handle snow and slush in an urban winter. Best Lightweight Stroller For Urban Parents (Winter). 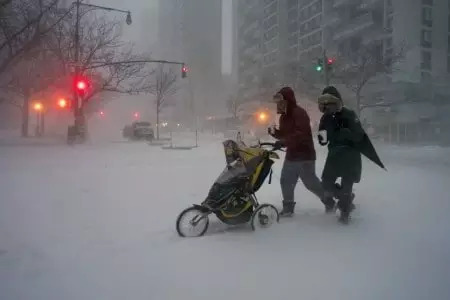 If you live in the city, you need a stroller that can navigate winter slush, snow and other non-weather city hazards (rough sidewalks). Our pick for these folks, the the Baby Jogger City Mini GT ( $251.99, 21.5 lbs. ), is similar to the base City Mini but adds bigger, no-flat tires, as well as an adjustable handle bar with brake, a redesigned seat/canopy that provides more headroom, and an easier to access storage basket. At 21.5 lbs., the City Mini GT pushes the outer limits of what we consider lightweight. But that’s the trade-off for the bigger wheels, which add about four pounds over the basic City Mini. Also: Baby Jogger has a raft of winter fighting accessories, like a foot muff (for baby) and hand muff (for parents). Add in the weather shield and this stroller can battle whatever Mother Nature throws at you. FYI: Baby Jogger is releasing a new revised version of the City Mini GT, called the City Mini GT 2. This stroller will have several cool new features including all-wheel suspension. The original version only had suspension on the front wheel. Also new are included car seat adapters for Baby Jogger and Graco infant car seats, a standing fold and a new adjustable footrest. With the new footrest, you can now access the front of the storage basket, although it will be a tight fit. With all these new features, look for a price increase. As of this writing, the GT 2 is only available on a few sites like Magic Beans, priced at $399. We expect it to come down a bit as more sites start selling it. This super lightweight umbrella stroller offers upgraded features not found on cheap umbrella strollers and it weights under 10 lbs. Canopy with extendable sun shade. Most umbrella strollers have very basic canopies with little protection from sun. That’s ok if you are in the mall—but once you are outside, there isn’t much protection from the weather. The G-Lite’s canopy has an extension that pops out to provide more coverage . . . and 50+ SPF protection. Mesh seat. Air flow is important to keep a baby/toddler cool in sweltering urban summers. The mesh seat on the G-Lite fits the bill. Standing fold. Once you fold an umbrella stroller, you’ll notice a dilemma—unless the stroller has a “standing fold,” you can’t just lean it up against a wall in a restaurant because they will fall over. The G-Lite’s standing fold is great for storage or use on the go. Light weight. We spec’d the G-Lite at 8.3 lbs, but that is without the canopy. With all the accessories (canopy, basket, etc), the G-Lite comes in at 10.7 lbs. Compare that to other “lightweight” strollers that are often in the 15 lb. range. Trust us, you’ll notice that extra five pounds when you carry it around. Pedicure friendly fold. Some umbrella strollers require you to hit a foot lever to close the stroller—that can be difficult if you are in flip flops. The G-Lite has folding triggers that don’t require any foot action. The G-Lite includes a cup holder, but a rain shield ( $19.99) and travel bag ( $69.99) are extras. The G-Lite has a seat that doesn’t recline—that means this stroller is best used for babies over six months of age. If your baby likes to nap in their stroller, the G-Luxe ( $278.99, similar to the G-Lite but upgraded) with its reclining seat may be a better bet. Overall, a few folks knocked the G-Lite for its value, or lack thereof. Yep, this is a chunk of change for an umbrella stroller—especially when compared with some of our recommended models for under $100. But the difference between a $30 stroller at Walmart and an UPPABaby is quality and durability. Cities tend to dish out more punishment to strollers, making the extra investment here worth it in the long run. Plus you can resell an UPPAbaby stroller for roughly half what you bought it, depending on how well you took care of it. The $30 one will go for $5 at a garage sale if you’re lucky! BabyZen’s YOYO+ stroller is a well-designed if pricey infant to toddler model with an impressive compact fold. Best High-Style Lightweight Stroller. France may be famous for its wine and cheese . . . but strollers? Not so much. BabyZen ‘s designer, Jean-Michel Chaudeurge, hopes to change that with stylish strollers that aim to complete with that other European designer stroller megabrand, Bugaboo. When the YOYO first came out, it didn’t make much of a splash. But BabyZen refreshed the stroller (hence the “+”) with a bigger basket, higher weight capacity, and padded carry strap. Yes it is very pricey, but they do throw in rain protector and now the YOYO+ works with infant car seats (via car seat adapters sold separately). Too bad the cup holder is an extra $30. Yes, if you tried to justify this stroller for overall value, it would be a tough sell. But the design is the star here, with the white suspension wheels and the ability to morph from infant stroller (with lay flat seat—part of a newborn bundle that sells for ) to toddler stroller with a cushy padded seat. We’ve been rating and reviewing strollers since 1994. In addition to hands on inspections, we also visit manufacturer facilities and meet with safety regulators—and when we travel, we pay our all of our own expenses. Much of our stroller advice and recommendations is based on our readers’ experiences—our stroller message board boasts 177,000+ posts! Of course, we also evaluate consumer reviews posted on sites like Amazon. Here’s how we came up with our stroller picks. First, we spend a good amount of time with hands-on inspections of strollers. We buy strollers at retail prices and also make trips to trade shows and manufacturer offices to see strollers first-hand. (We pay all our travel expenses, of course). The weights you see on this web site are from our own measurements with a calibrated scale. We don’t take manufacturer specs as gospel. Can we purchase every stroller on the market? No. That’s why we also gather significant reader feedback (our book, Baby Bargains has over 1 million copies in print), tracking strollers on quality and durability. Besides interviewing parents, we also regularly talk with stroller retailers to see which brands are most trustworthy and other key quality metrics. The reliability of stroller companies is another key factor—we meet with key company executives at least once a year. We’ve been doing this since 1994, and we have developed detailed profiles of major strollers brands that help guide our recommendations. See below for links. 1. What’s your stroller lifestyle? Before you fall you in love with a designer stroller, ask yourself HOW you will be using a stroller. Yes, you. Think of strollers as tools—the wrong tool for a job isn’t going to help, no matter how shiny it is. It’s the same for strollers. Because we all live in different environs and want to go varied places, the key to stroller happiness is to understand how different stroller options fit your lifestyle. Hence, the perfect stroller for hiking in Colorado isn’t the right one for a simple spin around the mall in Miami Beach. Climate plays another factor—in the Northeast, strollers have to be winterized to handle the cold and snow. Meanwhile, in Southern California, full canopies are helpful for shading baby’s eyes from late afternoon sunshine. 2. 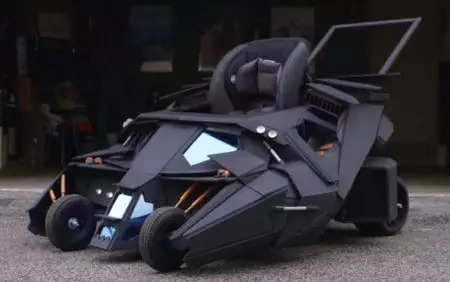 The perfect stroller doesn’t exist. Your stroller needs will change over time. Babies/toddlers use a stroller from birth to age four and sometimes beyond. The perfect stroller for a newborn isn’t necessarily great for a toddler—although some strollers make a valiant effort at bridging the years. And what if you add a second child in the mix? The take-home message: no one stroller can meet all these needs. Most parents end up with more than one stroller. Let’s review over the stroller landscape. Umbrella/lightweight strollers are generally under 20 lbs. in weight. Some feature two handles and a long, narrow fold (like an umbrella; hence the name!). Most umbrellas strollers are very cheap ($20 to $40), although some upper end manufacturers have spruced them up to sell for $100 to $300 (UPPAbaby and Peg Perego have “luxury” umbrella strollers). Premium lightweight strollers boast features like extendible canopies, storage baskets, and high quality wheels. Prices range from $150 to $300. Because seat recline can be limited, many umbrella/lightweight strollers are designed for kids six months old and older. Full-size strollers used to be called carriages or prams. These strollers are more like a bed on wheels with a seat that reclines to nearly flat and can be enclosed like a bassinet for newborns. All that stroller goodness comes at a price: hefty weight, as much as 30lbs. As a result, getting a full-size stroller in and out of the vehicle trunk can be a challenge. Entry level full-size strollers start at $200, but these can top $1000. In recent years, full-size strollers have fallen out of favor, replaced by . . .
Multi-function strollers work from infant to toddler with either an infant car seat adapter or bassinet accessory for newborns. Some multi-functions are even expandable into a double stroller with a second seat attachment. Expect to pay $300 to $1000 for multi-function options (accessories like second seats are almost always an additional cost). This stroller type has increased in popularity in recent years, as parents increasingly have kids that are close in age. Jogging strollers feature air-filled, bicycle-style tires and lightweight frames perfect for jogging or brisk walks on rough roads. The best strollers for running have a fixed front wheel for stability. 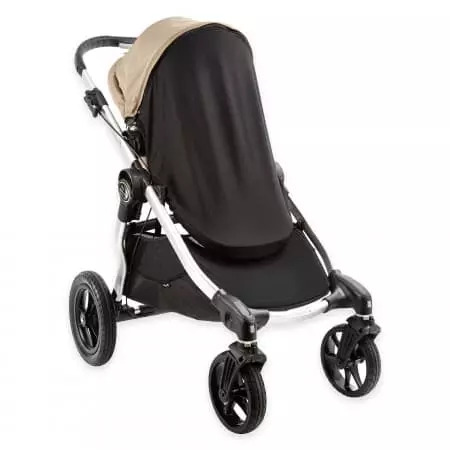 Jogging stroller with lightweight aluminum frames usually run $300 and up although there are some cheaper, steel framed options on the market too. All-terrain strollers are eclipsing jogging strollers for all but the most devoted runner. In fact, they often look like joggers but have a swivel front wheel. Big tires take to hiking trails better than typical stroller wheels, but these strollers are bulky and heavy. And expensive: they can run more than $400 for popular brands. Travel systems combine a stroller and infant car seat which snaps into the stroller. Typically sold at discount and big-box stores, travel systems are aimed at first-time parents and gift givers. Most feature basic infant car seats and full-size strollers at prices that range from $200 to $300. Travel systems have waned in popularity in recent years as more lightweight strollers have added infant car seat compatibility/adapters. 4. 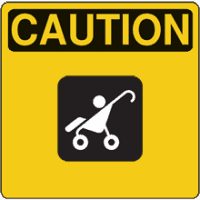 Beware these common stroller safety hazards. Just because a stroller is on the shelves at the Baby Megastore doesn’t mean it is safe. Twelve thousand babies each year are injured by strollers, according to the most recent government safety data. Never hang bags from the stroller handle. Yes, it is tempting to hang that diaper bag or purse off your stroller handles. The danger: your stroller can tip backwards—and even if your child is in the five-point harness, injuries can still happen. Solution: put that purse in your stroller’s storage basket. Or use a backpack diaper bag. Don’t leave your baby unattended while sleeping in a stroller. Newborns, infants and toddlers all move around when they’re sleeping. Injuries have occurred when babies creep down to the strap openings, so keep an eye on them. Or take a baby out of a stroller and put them in a full-size crib for naps. Don’t trust your brakes. 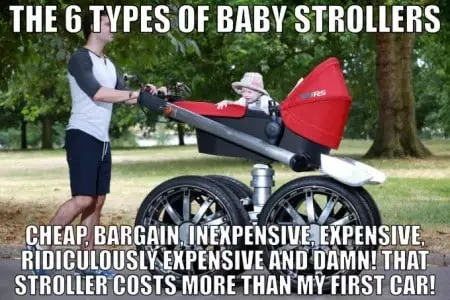 The best stroller models have brakes on two wheels rather than one. But even if a stroller has the best brakes on the planet, never leave a stroller unattended on an incline with your baby inside. Follow the weight limits. Forty pounds is typically the maximum for most strollers. Jogging strollers are best for babies over one year of age. Pediatric experts tell us the neck muscles of infants under one year of age can’t take the bumps of jogging or walking on rough terrain. Fold and unfold your stroller away from your baby. The opening/closing mechanisms of a stroller can be a pinching hazard, so don’t open or close your stroller with baby nearby. Graco recalled over 5 million strollers in 2014 for just such hazards. 5. The secret to a smart stroller test drive: add weight. Don’t test drive that stroller empty. Take a backpack and put in about 20 lbs. worth of books. Stick that in the stroller seat and you’ll see how that stroller actually steers/handles with a baby. And yes, practice folding and unfolding the stroller with the backpack in your arms! 6. What stroller features really matter . . . for babies. Reclining seat. If you plan to use this stroller from birth, the seat must fully recline. That’s because babies can’t comfortably ride in a sitting position until around six months. And most newborns spend their time sleeping—seat recline is a necessity. All wheel suspension. Stroller wheel suspension works like your car’s shock absorbers, smoothing out life’s little (and big) bumps. 7. What stroller features really matter . . . for parents. It’s all about the storage. Like napkins and toddlers, you can never have enough. We’re not just talking about the size of the storage basket (but that helps). It’s HOW you access the basket, especially if the seat is reclined. The best strollers add storage in areas you wouldn’t think—on the hood, the back of the seat, a storage compartment with lid in a parent console for your phone and so on. The right wheels. Going for a nature walk on a dirt trail? Air-filled 12″ rear tires are best. Navigating tight spaces at the Pikes Place Market in Seattle? Small 6″ wheels enable tight turns. Removable seat pad for washing. Crushed-in cookies, spilt juice and the usual grime can make a stroller a mobile dirt-fest. Some models have removable seat cushions that are machine washable—other models let you remove all the fabric for washing. Reversible seat. When baby is young, you can have your child face you. Then when your toddler wants to see the world, the seat flips around. The one-hand, flip flop friendly, standing fold. The fewer the steps and hands you need to fold a stroller, the better. The best models have one-hand folds that stand when collapsed. If your stroller has a foot brake or release, make sure you can do this in a flip flop—and the pedal doesn’t mess up a pedicure. Height adjustable handle. If you and your partner are two different statures, an adjustable handle is a must have. 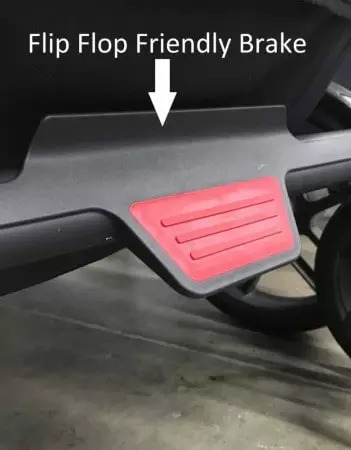 A flip-friendly brake allows you to set and release the brake with the same motion. No messing up the pedicure! There are three international organizations that test and certify textiles to meet enviornmental standards: OEKO-TEX, Global Organic Textile Standard (GOTS) and IVN Naturextil. All three of these certifications are optional—there is no legal standard for organic, non-allergenic, chemical free textiles in the US. Many of the stroller brands that are certified are European, with only a few US brands certified. Here’s a bit about each of the three organizations. GOTS (Global Organic Textile Standard) certifies textiles as organic. To meet their qualifications, “only textile products that contain a minimum of 70% organic fibres can become GOTS certified. All chemical inputs such as dyestuffs and auxiliaries used must meet certain environmental and toxicological criteria. The choice of accessories is limited in accordance with ecological aspects as well. A functional waste water treatment plant is mandatory for any wet-processing unit involved and all processors must comply with minimum social criteria.” Beyond using organic materials, companies must also be socially responsible to their workers and the community. Textile Exchange. Previously referred to as the Organic Exchange (OE) Standard, the international Textile Exchange certifies textiles according to their Organic Content Standard (OCS). They verify the steps in the supply chain to make certain the materials used in end products like diapers are sustainably sourced/grown, processed and manufactured. Orbit (OEKO-TEX). FYI: Orbit has discontinued all their strollers, but you may see them on eBay and second hand. By reading your post I knew about some latest lightweight strollers. I am just wondering about walking in the snow with strollers. Is it made for that situation? I use a 4 wheel stroller. But It can’t pass through the snow. So during winter, it’s very difficult to take my baby outside. These strollers are not designed for snow. I would suggest our all-terrain stroller picks. The BOB Revolution Flex http://amzn.to/2tCZPNM is our top pick for snow!